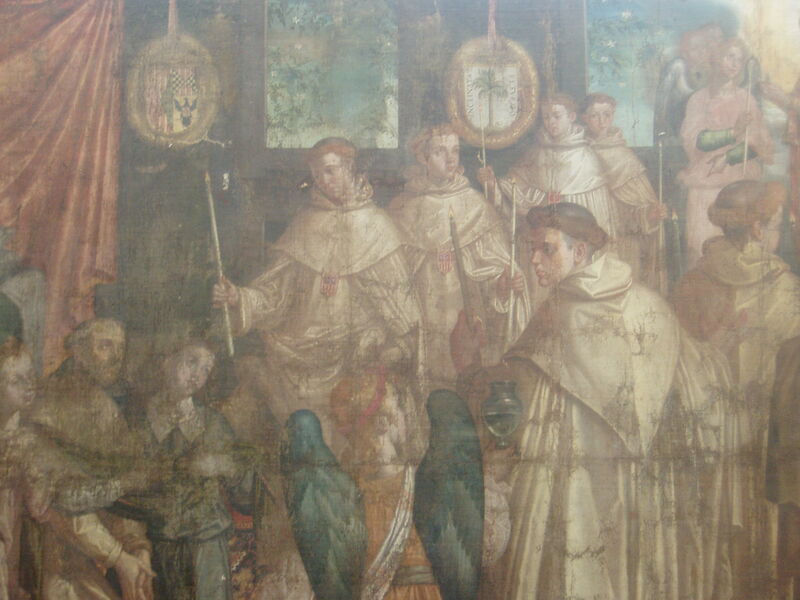 ‘The Last Communion of Saint Raymond Nonnatus’ by Francisco Pacheco is reaching the end of an 18 year journey of conservation treatment and will be shown for the first time in living memory in the new exhibition of Spanish Paintings here in The Bowes Museum on Saturday 11th of October. Pacheco was notable as the tutor of Velazquez in 17th century Spain and for writing an important treatise on the technique of Spanish Painting. There are few examples of his work in the UK and it is a mystery how this one appeared in County Durham in the 1960’s when it was given to The Bowes Museum. The conservation was begun by Richard Hobson in 1996 at the Museum when he was asked by the then Director Elizabeth Conran whether he could restore a badly damaged yet important work, the Pacheco. It had much flaking and abraded paint, was falling off its support and was very dirty. Richard sought lots of advice as to whether the painting was actually restorable, which is when I first examined it and he subsequently began this difficult task. Richard sadly passed away in 2004 and since then at least 7 conservators, including myself, have worked on it. The National Gallery has given invaluable help and support, and the painting has undergone a transformation. The size of the picture at 2 metres high and 2 and a half wide is a challenge in itself. It has been cleaned, had the old discoloured varnish removed, and flaking paint refixed in place. The old supporting lining canvas has been removed from the back and the old glue holding it in place painstakingly picked off with a scalpel (my fingers can confirm how painstaking this was!) Then a new canvas was attached on a specially heated suction table. Finally the painting has been revarnished and, after a year of careful retouching, the painting has been brought back to life. I hope you can come to the gallery to see it and read about its fascinating history, as one of a series of 6 paintings that were painted in Seville to commemorate the life of St Raymond Nonnatus, and how three more works also survive. I am currently producing a site about my brother, Richard Hobson, and have included a link to your article on the Pacheco. Please let me know if you update the site removing any references to Richard.